I’ve been doing weekly reviews of some of the new comics I get each week for a year or so now, but a while back I said I’d review some old classics, so here’s the first one, Frank Miller’s best Daredevil story, Born Again. 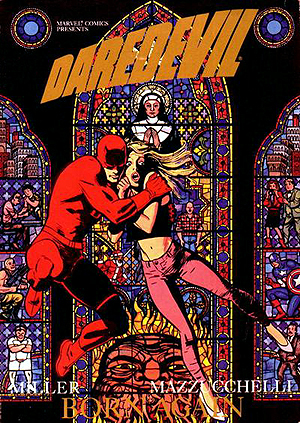 This story in nearly 30 years old yet it’s still the well that every single writer since has drawn from when writing about not just Daredevil, but that type of superhero however this is by far the best example of the story of a hero who has it all before being brought down by his main villain and then coming back from the dead and renewed in purpose. This entry was posted in Daredevil on April 5, 2015 by lowbrowcomics.